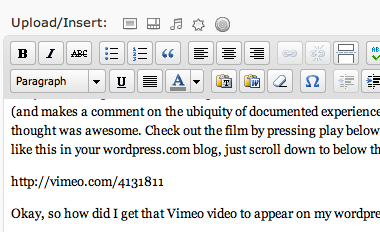 I wanted to embed something from Vimeo so that I could demonstrate to a wordpress.com user the easiest way to do it. The video I picked to embed is a short film (about 4 minutes, and it doesn’t seem that long) that I liked. The oddity of how someone goes from being a girlfriend/boyfriend to being an ex to being just someone in your old pictures is definitely something I have pondered myself. This may be due in part to the fact that my friends are still close to most of my exes, and some of the exes are fairly high profile in the tech community, so they pop up in the news I follow on a fairly regular basis. Even so, I think that attrition of attachment is something that almost everyone has experienced at some point or other, and this short film approaches it in an unconventional format (and makes a comment on the ubiquity of documented experience that has resulted from social media sites) that I thought was awesome. Check out the film by pressing play below, and if you want to know how to embed videos like this in your wordpress.com blog, just scroll down to below the video for my quick instruction. Okay, so how did I get that Vimeo video to appear on my wordpress.com blog? Hover over video on Vimeo, click on the “embed” button, copy the code that looks like the image below, and paste it into my wordpress.com post editor. I repeat: I did NOT do it that way. Why? Because that embed code won’t be accepted for security reasons, and you’ll just see a link to the video. But! Because Vimeo is a trusted provider, they’re “whitelisted” on wordpress.com for use with the oEmbed format. That means it’s actually even easier to embed Vimeo videos on wordpress.com than it would be with their embed code. All you have to do is copy and paste the URL of the Vimeo page onto its own line, and WordPress will transform that URL into an embedded video. Flickr (both videos and images), Viddler, Hulu, Qik, Revision3, Scribd, Photobucket, Polldaddy, Google Video, WordPress.tv, Funny or Die, SmugMug, Blurb, Entertonement, SoundCloud, official.fm (old Fairtilizer links work, too).